The Mozart-Gemeinde in Berlin had acquired over 300 members when the founders decided to launch a quarterly publication devoted to "all those things, which either reveal new insight into Mozart, his life and his works, or which contribute to the continuing veneration of his divine genius." 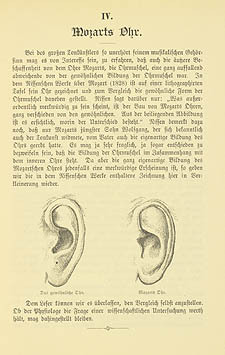 Amongst articles listing manuscript copies of his music, letters to and from his wife, and essays on the reception of his operas and iconography, appeared the essay entitled "Mozart’s Ear," a scientific investigation of Mozart’s physical features as an indicator of his genius. Mittheilungen fuer die Mozart-Gemeinde in Berlin, fuenftes Heft (Februar 1898), p. 165.